verb tr. : To develop immunity to a poison by gradually increasing the dose. After Mithridates VI, king of Pontus (now in Turkey) 120-63 BCE, who is said to have acquired immunity to poison by ingesting gradually larger doses of it. Earliest documented use: 1866. The noun form is mithridatism. 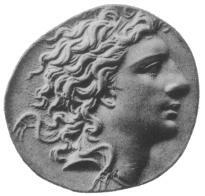 Mithridates VI’s father was poisoned. No wonder VI wanted to develop tolerance to poison. The story goes that after VI’s defeat by Pompey, he didn’t want to be captured alive. So he tried to end his life by taking poison. That didn’t work, so he had a servant stab him with a sword. Bernard Werber; Empire of the Ants; Bantam; 1999. Sarah Birke; Bedazzled by Gadgets; New Statesman (London, UK); Dec 11, 2006.